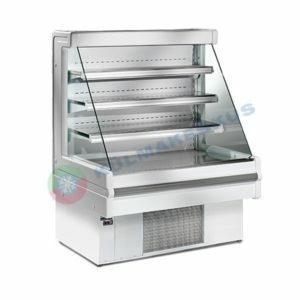 Display cabinet made of two sections: a lower refrigerated self-service part with stainless steel display surface with upper lighting, and a non-refrigerated upper part equipped with intermediate shelf and rear sliding doors and upper lighting. Frame with wheels. Automatic defrosting and an electric evaporation of defrost water. In COMBI and SPLIT displays you can display goods in two separated cooling areas – to have a self-service and service display in a single unit, whereas it retains stylish design of the whole Georgia III range of displays. The self service area has 2 shelves and temp. range +4 / +8 °C. Serve over area has 3 shelves and same temp. range. Anyway because of each area is controlled by independent control unit you can set different temperature for each area. All glass panels (excluding glass shelves) are made of insulating and tempered double glass. For easy access, sliding doors are fitted in the back part; hinged curved front glass is designed for easy maintenance. 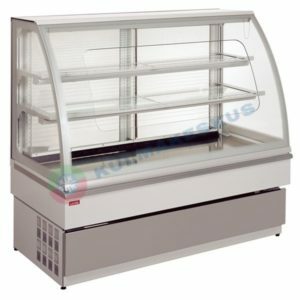 Under each glass shelf there is a fluorescent light which increases the attractiveness of the displayed goods. The operation of the showcase is controlled electronically, including automatic defrosting. The cooling by forced air circulation provides perfect cooling for the entire display area of the showcase. There is also an option to order a special version on wheels. However if you need a display that fits to the standard Georgia III range of displays we recommend version without wheels. Georgia III Static belongs by its style and design to the Georgia III range of products. 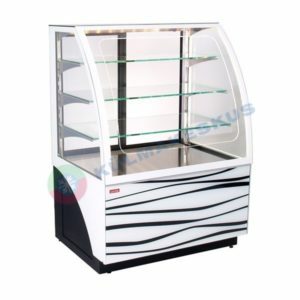 This luxury cabinet is intended for the presentation and sale of sweet pastries, especially those filled by whipped cream, butter cream or custard, because cooling by forced air makes these products dry in short time. Static cooling by this cabinet provides perfect cooling for the entire display area of the showcase. The evaporator is placed under each shelf and cold air falls down naturally. Under each glass shelf there is a fluorescent light which increases the attractiveness of the displayed goods. All glass panels (except glass shelves) are made of tempered and double glass. For easy access, sliding doors are fitted in the back part; hinged curved front glass is designed for easy maintenance. The operation of the showcase is controlled electronically, including automatic defrosting. Georgia III self-service belongs by its style and design to the Georgia III range of products. These luxury cabinets are intended for the presentation and sale of pastry goods. 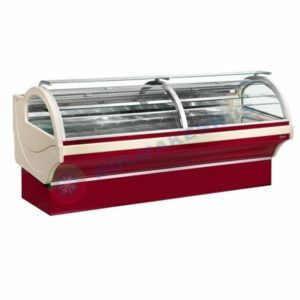 The shelves and the bottom shelf are refrigerated and under each glass shelf there is a fluorescent light which increases the attractiveness of the displayed goods. All glass panels (except glass shelves) are made of thermo-insulating double glass. For easy access, sliding doors are fitted in the back part; hinged curved front glass is designed for easy maintenance. The operation of the showcase is controlled electronically, including automatic defrosting. The cooling by forced air circulation provides perfect cooling for the entire display area of the showcase. The whole display is a unique development achievement to allow this kind of cooling. Georgia III 1000 Self-service has a huge opening in the front and three shelves by default. If you intend to use the display in a line with Georgia III 1500 self-service, which has two shelves only, there is an option with standard opening in the front and 2 shelves produced on demand. The elegant showcase ALDAN Lux is newly available as self-service version. 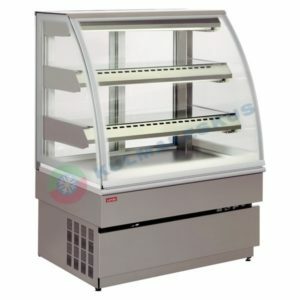 This model is designed for pastry shops, coffee bars, bakeries, restaurants and filling station. 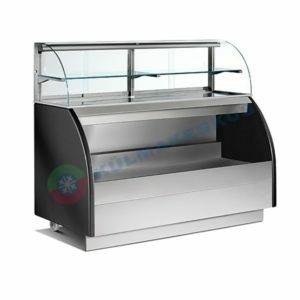 Refrigerated self-service display case of small dimensions, with ventilated refrigeration, suitable for the display of drinks, packed sandwiches, packed salads and for the sale of promotional products. Provided with 3 stainless steel inclinable shelves and with upper lighting. Built-in unit with electric defrost water evaporation. Working plate and display surface in stainless steel 304. Aluminium glass frame, cylindrical tempered glasses sliding along rails. Control panel with digital controller and defrost at intervals, plastic pan for the collection of defrost water to be emptied manually. Different colours available as per colour chart. 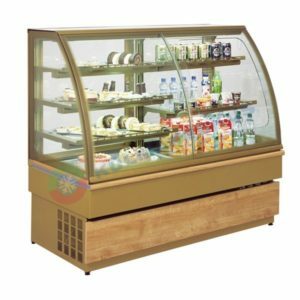 The refrigerated case Bighorn with modern design is ideal for presentation and sale of cooled products and is especially convenient for small and medium size shops. The display area of the case is equipped with two shelves and bottom, there is also a fluorescent light in the upper part of the case. 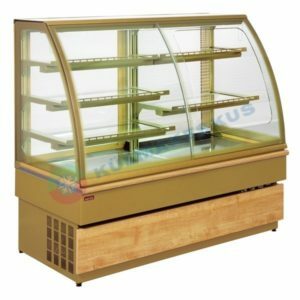 The easy access to displayed products allows the sell over model the back sliding glass and the self service model the front hinged perplexes. The refrigerated show case Bighorn Remote has got an aggregate placed away from the showcase. The maximum distance of 2 meters (standard), is designed for chilled food presentation and sale. The showcase is connected to the aggregate unit by thermoplastic hoses and quick-acting couplings, which enable fast connection without the necessity of contacting specialised engineers. The next big advantage is greater flexibility, in placing the aggregate under the showcase and also the possibility to disconnect and reconnect the unit in the future. Wherever deciding to place the aggregate, make sure there is good ventilation, to increase the cooling systems’ life. Saa osa parimatest pakkumisest ja uudistest!